A musical biography, Walk The Line chronicles the career and personal life of country singer Johnny Cash. As a child growing up on a cotton farm in rural Arkansas, Johnny is traumatized by the accidental death of his older brother Jack, and never overcomes his strict father Ray (Robert Patrick) believing the wrong son died. After a stint in the army stationed in Germany, Cash (Joaquin Phoenix) marries his sweetheart Vivian (Ginnifer Goodwin). They settle in Memphis and start a family. He is useless as a salesperson and instead dreams of a music career. With unpaid bills and eviction notices mounting, he records his first song, local success follows and he starts touring. On the road John meets vivacious country singer June Carter (Reese Witherspoon) and is immediately smitten. They are both married to others, but start a deep friendship that goes through ups and down as Cash's fame spreads with a succession of hits. June refuses to become romantically embroiled while Johnny is married. He is soon addicted to drugs and alcohol, and both his career and his health start to suffer. 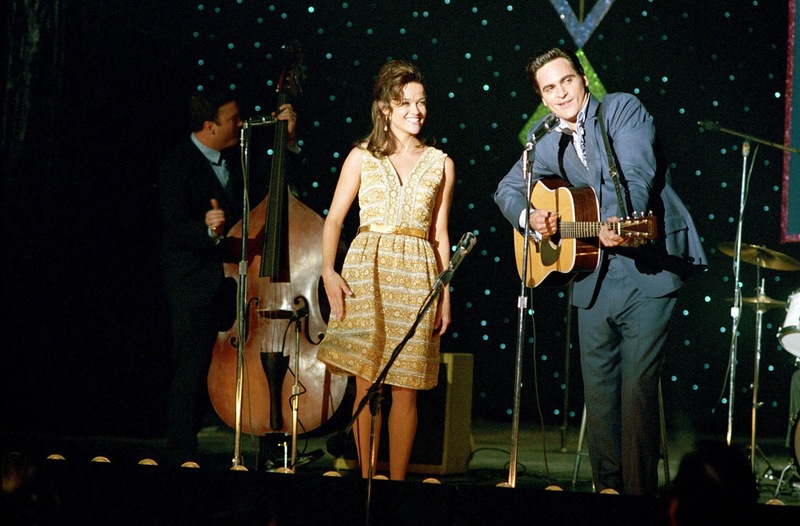 Directed and co-written by James Mangold, Walk The Line is a satisfying mix of biography, romance and drama. The film covers Cash's life from childhood in the mid-1940s to the late 1960s, and Mangold finds some good anchors to hang the story on. The death of beloved older brother Jack is a childhood trauma that resonates throughout John's life, and the strained relationship with his father Ray is another long-running source of tension. But it's the love story between Cash and June that emerges as the defining relationship in John's life, and Mangold is able to portray the aching longing between two performers meant for each other but held back by personal circumstances. June is the more thoughtful adult in this couple, doing the math and concluding that as long as John is married there is no payoff in yielding to his desperate appeals for deep commitment. Their journey towards finding each other is long, painful and convoluted, but Mangold nails the resolution in the film's emotional highlight (which takes place on stage, of course). In terms of Cash's musical career, the film features many of his most famous hits, delivered with conviction by Phoenix in a series of performances in various venues, ranging from tiny school auditoriums to massive stadia. Folsom Prison Blues, I Walk The Line, Ring Of Fire, and Home Of The Blues all make an appearance. The film starts with Cash's legendary show inside Folsom Prison, and loops back much later to reveal the event's place in his legacy. Joaquin Phoenix finds all the different facets of Cash, from fresh faced and eager to washed up and worn down by all the pills and alcohol. Reese Witherspoon won the Best Actress Academy Award as June Carter, an energetic entertainer with a remarkably firm grip on reality despite the craziness of life on the road as a mother of young kids. At well over two hours the film does drag, and the scenes of moping and personal disintegration caused by substance abuse do soldier on long after the point is made. 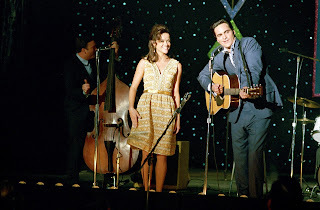 But overall Walk The Line is a heartfelt and worthy tribute, both to the man himself and the woman standing by his side through good songs and bad.